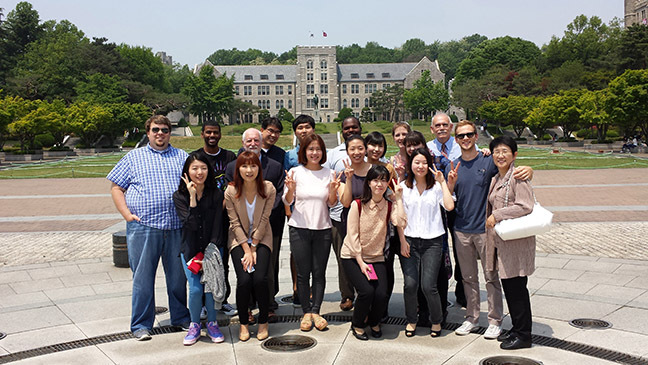 The 2014 summer graduate study abroad program was implemented in Korea from May 6-14. In conjunction with graduate students in Korea University, six masters and doctoral program students in Counselor Education and Counseling Psychology participated in the jointly designed graduate-level course: COUN7970 Special Topics: Global Studies in Counseling and Research. The purpose of this program is to enable participants to expand their international perspectives on critical counseling and educational issues and to enhance cross-cultural research competencies in a graduate course. Dedrick Ford was particularly excited about the blend of academic, social, and cultural opportunities afforded by the trip. Weston Blake Sandusky was similarly excited about the opportunities to expand his cultural understanding. Kelly Sarah Hughes also suggested that the cross-cultural counseling discussions made the trip worthwhile. To learn more about the Korean initiative, contact Professors Pipes or Suh in the College of Education. Story by George Littleton. Photo, contributed.